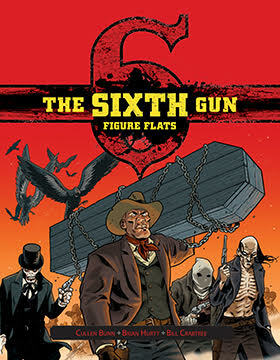 Our latest batch of Figure Flats is for The Sixth Gun Roleplaying Game, featuring amazing full color figures by three-time Hugo Award winning artist and colorist Cheyenne Wright, based off the phenomenal work of Brian Hurtt! White Hats: Becky Montcrief, Drake Sinclair, Billjohn O’Henry, Brother Roberto, Kirby Hale, Gord Cantrell. Bad Guys: General Oliander Hume, Missy Hume, “Filthy” Ben Kinney, Silas “Bitter Ridge” Hedgepeth, “Bloodthirsty” Bill Sumter, and “Old” Will Arcene! 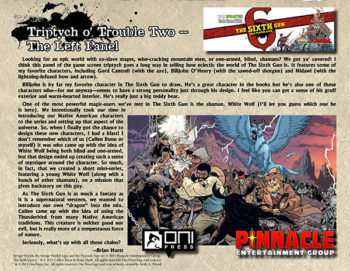 You also get Cowboys, Pinkertons, Husks, Indians, and the mysterious Asher Cobb, as well as the Thunderbird, Winter Wolf, Great Wyrms, Serpent Men, and the legendary Griselda!